I have always felt that Chess was a game beyond me, something for 'smarter' people to learn. Then my kids started learning how to play Chess and I was still out on the fringe! If they could learn it so could I right?? We had the opportunity to review for Chess House and jumped on the chance. The older kids love to play Chess and the younger ones have been showing a desire as well. Look like a professional chess player when you walk into a room with this case!! We set up our board and started the DVD. My 11 year old did mention that he knew some of the instructions, but my 9 and 6 did not, and of course I barely even knew the names of the pieces. I really liked Elliots style on the DVD. He was energetic and engaging for the kids and myself. I kind of expected a Chess DVD to be boring, which I know is a stereotype. Elliot breaks up the information into easy to understand steps, and keeps it short and sweet. Elliot speaks directly to us to describe every part of the chess board, the pieces, and finally game play in the DVD. There are 10 episodes in the 49 minute DVD. 1.White on Right is the correct way to set up the Chess Board. 2.The Chess board squares are named similar to that of Battleship. The graph set up was great to get down so that the kids were able to utilize the different moves and understand them. The diagonal is also important. Maverick age 6 "I liked the DVD because it helped me learn about it. I learned that the pawn can move 2 it's first move." Shiloh age 9 "I learned that if the pawns make it to the other side, they can become anything." Canyon age 11 "I am ready for a challenge after watching the DVD. I think I can play with the big brothers better now. The DVD did help learning how to use each of the pieces different ways. It gave good strategies. The chess set is big enough where you can get to all of the pieces, but not so huge that you have to bend over to get them." I was excited as we studied the country of Russia to read that it a very popular game there. Our review of Chess House fit right into the study of Russia. I love how God works those things out ahead of time! 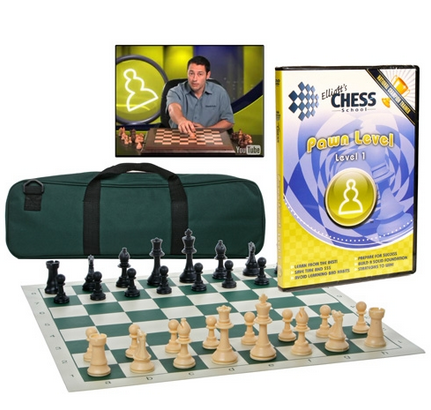 The have many other products at Chess House, including 5 more DVDs for advanced play. See what my Crew Mates thought of Chess House and their starter kit by clicking on the banner below.